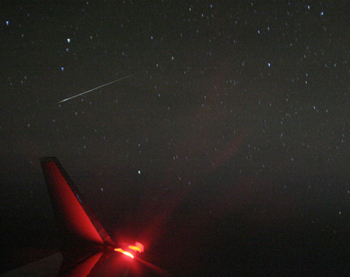 The annual quadrantid meteor shower is underway and began about December 28th. They are expected to peak on Sunday, January 3rd and continue on through January 8th. Unfortunately for those of us in Hawaii, it peaks at 2am UTC meaning it will peak Saturday, January 2nd at 4pm. Also, working against a good viewing on this shower is the moon which was just full on New Year’s eve. Still bright , the moon will wash out most of those that do streak across the night sky. It never hurts to go out and star gaze for a while as even on a regular night in Hawaii, you can generally catch a “falling star” or make a wish on a “shooting star”. You may even see a nice fireball. I’ve seen and reported two fireballs in my two and a half years down here on the coast to the international meteor organizationwebsite (IMO) and the american meteor society (AMS). One flashed green and lit the sky up like daylight for a few seconds. Awesome. Look up and enjoy! Nice website featuring current events in the sky. Of note, are astronomical monthly dates and times.